Though this is a somewhat larger-than-normal issue, the pace never attempts to slow down. For his grand finale with the team, Mark Millar tries to cram as much action and resolution into a single issue as I think I've ever seen in a standalone edition. The end result is roughly one major finale every page and a half, perhaps six issues' worth of storytelling in little more than a single month's page count. If that sounds like it moves pretty quickly that's because it does, and it's not always for the best. It's great that this whole arc is coming together so quickly (and the timing really does feel just about right) but when gargantuan battles are both begun and concluded within just a few panels, the magnitude of each moment is unfortunately tossed by the wayside. While I appreciated the slow, intellectual pace taken during the first few steps of his run, Millar pays the price for that decision here. The issue holds a great lump of wonderful ideas that seem destined to go unappreciated, even unrecognized, because they're so abundant and rapid-fire. It's good stuff if you've got a microscope and the patience to figure everything out with such a minimal explanation. Fresh off a lengthy run with Brian Bendis on Ultimate Spider-Man, Stuart Immonen has stepped in to cover for Bryan Hitch, providing artwork for the final leg of this storyline. It's a bit odd that Hitch couldn't manage to produce more than the cover for this, his swan song with the team, but if such a replacement really was necessary I can't argue with Marvel's selection. Immonen made quite a name for himself aboard USM, more than adequately filling the shoes of longtime collaborator Mark Bagley, and he proves to be up to a similar creative challenge here. His rendition of the publisher's famous first family carries a more mature flavor than his preceding efforts with Spidey and pals, but lacks none of the panache. Immonen doesn't shy from the same incredible timing, deep personalization and knee-shaking perspective that made him an instant favorite in his previous gig. 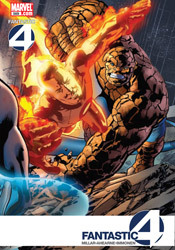 His take on the four has a slightly different slant than his rendition of Peter Parker – they wear their years and accumulated wisdom on their sleeves – but they still bounce around the page with boundless enthusiasm and limitless energy. If he hadn't already done so beforehand, Immonen really solidifies his status as one of Marvel's greatest, most consistent talents within this issue. It's great work from cover to cover. There's a little bit of everything here; sci-fi adventuring, brutal action, brainy meetings of the minds, warm romance… the works. Problem is, it often borders on (and occasionally leaps beyond) the line of excess. There's so much going on that it can be difficult to stand still and savor the moment. It's well written, despite a few lines of corny dialog from guest scriptwriter Joe Aheame, and the visuals are genuinely outstanding. Still, I couldn't shake the feeling that something wasn't quite right. It's worth borrowing, at least, because when it's good it's really good. Just expect a bit of whiplash.